Natural Products Expo West, the industry’s largest trade show, took place last weekend in Anaheim, California with more than 3,000 exhibiting companies and 70,000 attendees. As usual, there were plenty of new gluten-free products announced at the event. 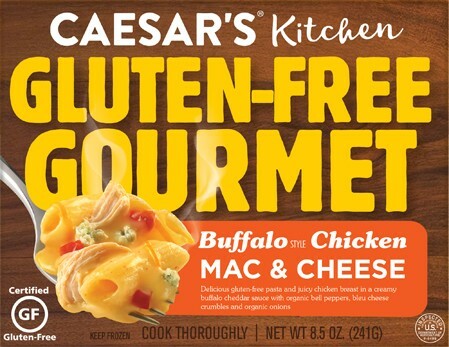 South Jersey-based Caesar's Pasta debuted a new line of frozen entrees under the Caesar's Kitchen brand that will hit store shelves this summer. The new "Gluten-Free Gourmet" meals include Buffalo Style Chicken Mac & Cheese and 3 Cheese Herb Rigatoni & Meat Sauce. 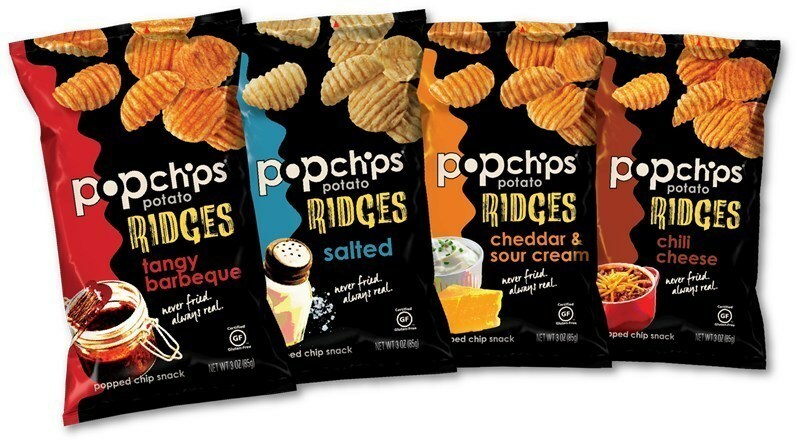 popchips announced an entirely new product line called Ridges, after spending several years experimenting with its process of combining heat and pressure to create a ridged chip. The new Ridges line rolls out to retailers nationwide in June in four flavors: salted, tangy barbeque, cheddar & sour cream and chili cheese. Ridges will be available in both a single-serve bag and a share bag. In addition to the four new Ridges flavors, original popchips come in nine varieties: sea salt, barbeque, crazy hot, sour cream & onion, sea salt & vinegar, sweet potato, cinnamon twist sweet potato and organic kettle corn. Deep River Snacks' newest product line is HONCHOS Tortilla Chips. The snack chips are made with 90-100% organic ingredients, are 100% non-GMO, certified gluten free, and made without artificial dyes, flavors and preservatives. 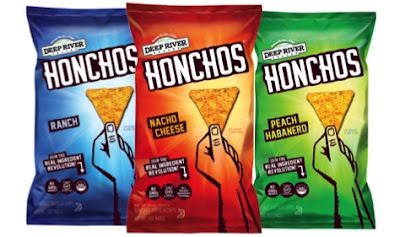 HONCHOS are available in three varieties: Nacho Cheese, Ranch and Peach Habanero. Ranch and Peach Habanero are 100% organic and bear the USDA Organic Seal; Nacho Cheese is 90% organic. Dr. Praeger's new veggie burgers include gluten-free Heirloom Bean, showcasing six varieties of beans, lentils and delicate herbs, and Mushroom Risotto, featuring roasted mushrooms and simmered Arborio rice with a hint of truffle oil. The company also released new Kale Littles, kid-friendly bites in fun shapes with kale as the first ingredient. The new 4-pack veggie burgers and 10-ounce Kale Littles are made with whole foods ingredients. In addition to being certified gluten free, the new burgers are Kosher and verified by the Non-GMO Project. The products are available at Whole Foods Markets through April, followed by expansion into additional natural food stores and conventional grocers. OH YES! 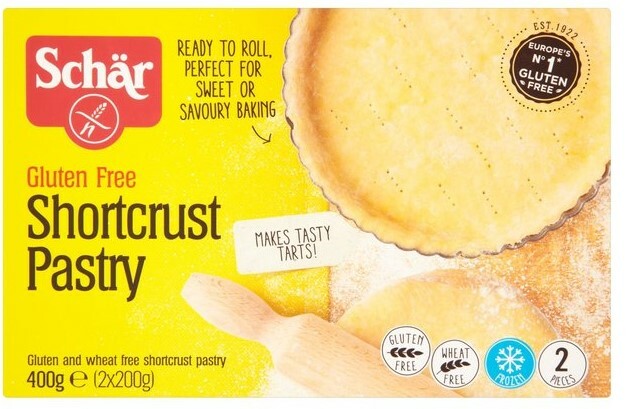 Foods, the first company to create frozen pizzas with 12 fruits and vegetables in its crust and sauce, debuted its new personal-sized pizzas at the event. 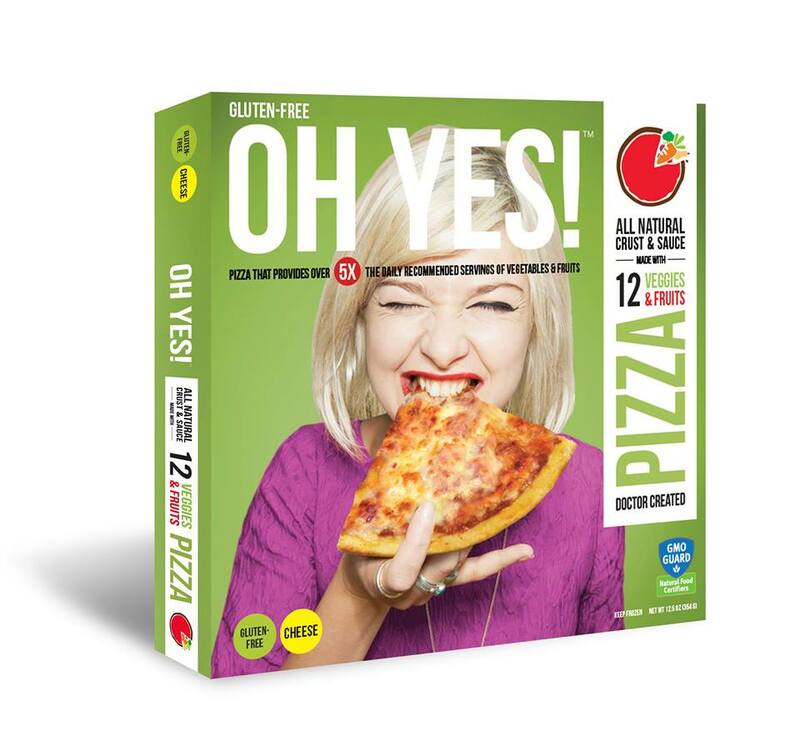 The Gluten-Free/Mozzarella and Gluten-Free/Dairy-Free pizzas are all natural and Non-GMO. All OH YES! pizzas contain 12 fruits and vegetables in the crust and sauce, including artichoke, broccoli, carrot, green pepper, kale, papaya, guava, beet, tomato, cauliflower, onion, butternut squash and quinoa. The pizzas are currently available in the Western and Southwestern U.S. Enjoy Life Foods is launching a line of plant-based ProBurst Bites and smaller, snack-size versions of the company’s cookies: Soft-Baked Cookie Minis and Crunchy Cookie Minis.The company's new ProBurst Bites flavors include Cinnamon Spice Chocolate, Mango Habenero, Cranberry Pomegranate and Cocoa & Roasted SunSeed Butter. Rolled in a crunchy blend of seeds and spices, with a smooth creamy chocolate center, all four flavor profiles boast at least six grams of plant-based protein per serving. The new bite-size cookie snack-packs are available in Chocolate Chip, Double Chocolate Brownie and Snickerdoodle for the Soft-Baked Minis, while the Crunchy Cookie Minis are available in Chocolate Chip, Double Chocolate, Vanilla Honey Graham and Sugar Crisp. These products will be available at retailers nationwide this summer. 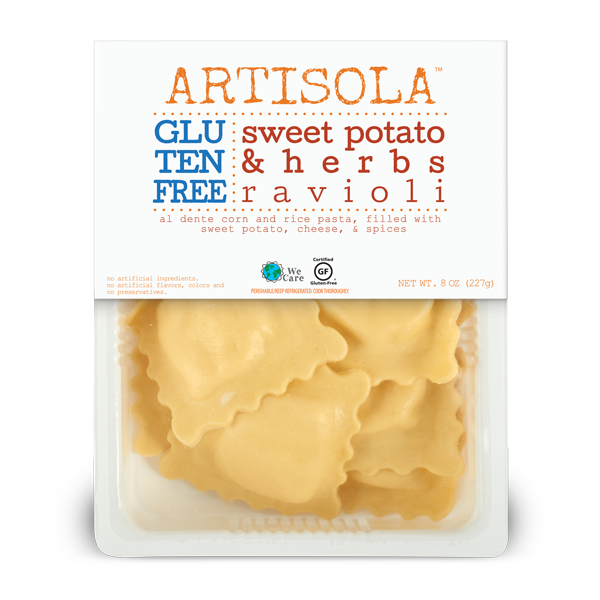 California-based Artisola debuted a Non-GMO Project Verified line of refrigerated pastas and sauces. The assortment includes several gluten-free offerings, including Gluten-Free Sweet Potato & Herbsw Ravioli, Gluten-Free Kale, Garlic & Cheese Ravioli and Organic Superfood Pesto Sauce. These will be available nationally at natural food stores beginning this summer. Simple Mills is extending its reach beyond the baking aisle with a new line of almond flour crackers. Each variety – including Fine Ground Sea Salt, Rosemary & Sea Salt, Sundried Tomato & Basil, and Farmhouse Cheddar – is Non-GMO Project Verified, certified gluten-free, paleo-friendly, and made with whole food ingredients with no grain, soy or artificial flavors or fillers. The base flour of the line is a proprietary blend of almonds, sunflower seeds and flax seeds. The line will hit store shelves this spring, with national distribution commitments already secured from Whole Foods. They can be purchased now through the company's online store. This summer, look for Schar's new butter cookies, biscotti and chocolate thins, as well as a shortcrust pastry and lactose-free Pizza Margherita - all imported from Italy.